Those are can be used for external or internal both. We are offering to our clients a wide range of FRP Rabbit Dustbin. With a firm commitment to quality, our organization is engaged in offering a wide ambit of Rabin Dustbin. - FRP made with 450 emulsion glass reinforced stunned mats of repute company. 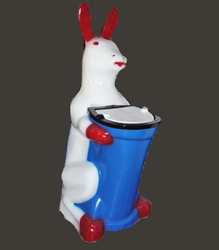 We are engaged in manufacturing a wide range of Rabbit Dustbin. The rabbit holding the dust bin gives it a special look. This dustbin can be placed in your room or public places like Offices, Amusement Parks and Bus & Railway Stations. Moreover, this dustbin is portable and occupies little space with good storage area. Fiberglass is a lightweight, extremely strong, and robust material. We are conspicuous home that is engraved in manufacturing and trading of a vast range of FRP Rabbit Dustbin for home, schools, gardens and public place to keep clean atmosphere. Attractive shape instants people to not to throw waste other than dust bins. Keeping the diverse requirements of the customers in mind, our company is involved in offering superb quality range of FRP Rabbit Dustbin. Diamension: L11.5" x W18" x H27"
We are offering Kids Green Rabbit Bin to our clients. Banking on our vast experience in this domain, we are engaged in providing a quality assured ambit of FRP Rabbit Dustbins. We offer Outdoor Dustbins in the shape of Giant, Fish, Rabbit and Fat Man.